I’ve just moved into a creepy old manor house with my family. And it feels like the house is waiting for something. I can’t explain all the things that are happening here. I hear maids sobbing, there are old ladies that stand in the hall. Are they real? Then there’s cold breath of life-or deathin the air. I can’t tell Dad or Mum. But least I’ve got my little brother Ben to talk to. This is a ghost story unlike any other-it will leave you chilled to the very last page. **This book was provided to us by the publisher for an honest review. 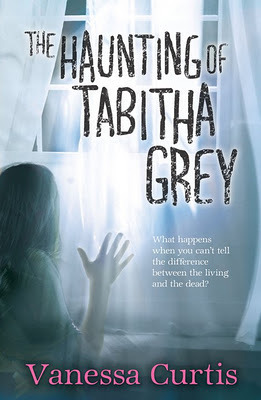 One word comes to mind when I think of The Haunting Of Tabitha Grey…creepy! If you are looking for a book that will make you jump at sounds in the middle of the night, this is it. Vanessa Curtis does a fantastic job of allowing the reader to see the world in the eyes of Tabitha Grey, a young girl who seems to have the gift of seeing the ghosts of the dead. Not only does she have the stress of that, but she also bears witness to the downward spiral of her parent’s marriage, with a mother who suffers from migraines and depression, to a father who has wandering eyes. Once I was able to buckle down, and commit myself to reading this book on its own, I completely devoured it. The world that Curtis portrays is one that is haunting and mysterious. It was as though I was reading/watching an episode of “Paranormal State”, minus the ghost hunting, and more focus on the actual haunting. I was a huge fan of that show, and so to have had the opportunity to read this book and review it was totally awesome. Anyone who reads The Haunting Of Tabitha Grey will clearly see just how phenomenal a story teller Vanessa Curtis is. Her writing style had me reading with my eyes wide open, waiting in anticipation for the next paranormal encounter. Her descriptions of the events as they unfolded, including smells and sounds made the story seem even more believable. As she describes an upcoming encounter with the sound of static, it reminded me of how in the “Paranormal Activities” movies where something was going to happen there was that rumbling sound. As soon as the mention of the static starts, my heart would quicken, and I would start to read faster! The true gasping moment was the end, of course. I did not see it coming, and quite literally gasped! All eyes in the room were on me, I was so loud. With a wave of my hand to fam., I was able to finish the book and walked away with it still blowing my mind. Trying to figure out how I didn’t see it before, and what clues I could have missed. Loved it! Fans of The Sixth Sense, and anything paranormal will completely devour The Haunting of Tabitha Grey. thank for that lovely review of my book. Much appreciated.